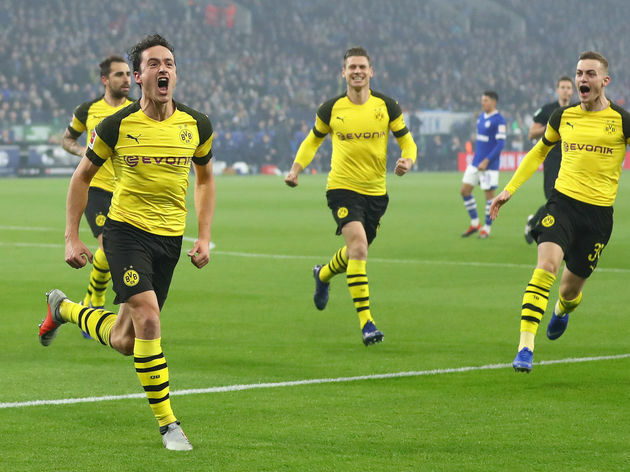 Borrusia Dortmund continued their fine start to the 2018/19 Bundesliga season, defeating region rivals Schalke 2-1 at the Veltins Arena on Saturday afternoon. Still unbeaten and holding a seven point caution at the top of the summit, Lucien Favre’s side took a 7th minute lead through summer signing Thomas Delaney off a Marco Rues free-kick. Schalke leveled matters in the second half as Daniel Caliguiri converted from the spot but that only set the tone for Jordin Sancho to win it for the visitors with 16 minutes on the clock. On the same day, Bayern Munich returned to winning ways thanks to a 3-0 win over Nurnberg at the Allianz Arena. Robert Lewandowski helped himself to a first half double before Frank Ribery put the game to bed with a goal of his own 11 minutes into the second. Victory for Bayern takes them into third on the log, 9 points behind leaders Dortmund. At the Borrusia Park, Monchengaldbach continued their fine run of form with a 3-0 victory over relegation threatened Stuttgart. A goal each by Raffael, Florian Neuhaus and an own-goal by Benjamin Peverd were enough to ensure that Deiter Hecking’s side remain second, seven point behind Dortmund. Elsewhere, RB Leipzig lost 3-0 away to Freiburg while Frankfurt were subjected to a second successive loss as they went down 1-0 at Hertha Berlin. At the wrong end of the table, aside from Freiburg, only Bayer Leverkusen were victorious over the weekend. Heiko Herrlich’s charges overcame a spirited Augsburg side 1-0 at the Bayer Arena with the lone goal coming from Lucas Alerio, 15 minutes from time. In France, only four of the scheduled 10 fixtures were played over the weekend following week-long riots across major cities. In Lille, second side Lille were held to a 1-1 draw at home to Reims. Remi Oudin put the visitors in the lead on the hour mark before a 90th minute Nicholas Pepe penalty salvaged a point for Christophe Galtier’s side. 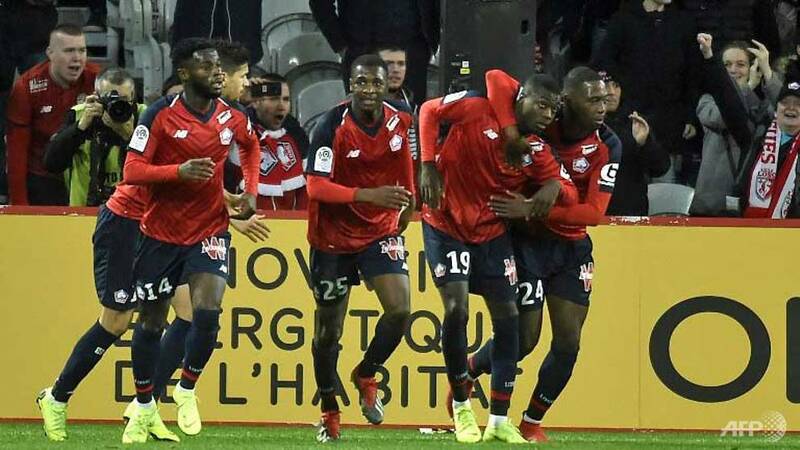 Lille now close the gap between them and PSG, whose game with Montpellier was postponed, to 13 points. At the Stade du Roudourou, 10 Man Guingamp were subjected to a fifth home loss of the season as Aimens ran away 2-1 winners on the day. Eddy Gnahore put Aimens in the lead on 63 minutes, Etienne Didot restored purity for the hosts seven minutes later before Colombian-Steven Mendoza won it for the visitors with 9 minutes to play. Guingamp’s Marcus Thurum saw red inside added on time for the home side to finish the game with 10 Men. Elsewhere, Strasbourg and Caen played out a 2-2 draw at the Stade de la Menaiu while Rennes were 2-0 winners over Dijon. In the Italian Serie A, Juventus maintained their eight point caution atop the standings thanks to a 1-0 win over Inter Milan in the Derby da Italia played on Friday night. Mario Mandzukic scored the only goal of the game with 24 minutes to play and subsequently subjected Inter to a fourth loss of the season. Second-placed Napoli ran out 4-0 winners over Frosinone on Saturday. A goal each from Piotr Zielinski and Adam Onus put Carlo Anchelloti’s side on their way to victory before Arkadiusz Milik sealed the points with a second half double. For Milan and Lazio who sit 4th and 5th on the table, they both drew 0-0 and 2-2 at home respectively. Genero Gattuso’s Milan were held at the San Siro by 6th placed Torino while Lazio could not hold onto a 90 minute 2-1 lead as they conceded a late Riccardo Saponara strike to share the spoils with Sampdoria. Elsewhere, Only Atalanta who defeated Udinese 3-1 away from home and Empoli (2-1 winners at home to Bologna) were victorious on a weekend which saw only four victors in the entire divison. In the Spanish La Liga, Barcelona moved three points clear at the top of the league thanks to a 4-0 victory away to city rivals Espanyol. 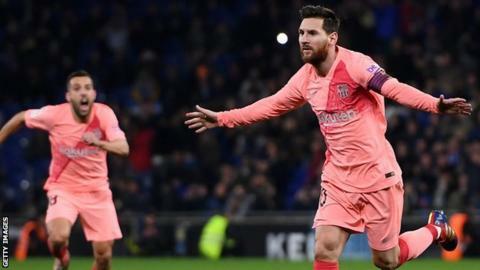 Lionel Messi struck a double including a magnificent free-kick to put Barcelona in the lead. The other goals were scored by Ousman Dembele and Luis Suarez. For Real Madrid, they dug deep to defeat Huesca 1-0 at the Estadio Alcorez on Sunday. Gareth Bale scored the only goal of the game with in 8 minutes of the kick-off. The win means that Real climb into 4th on the log, five points behind leaders Barca. At the Estadio Mestalla, Valencia held second placed Sevilla to a 1-1 draw on Saturday afternoon. The visitors went 1-0 up 10 minutes into the second half through a Pablo Sarabia’s strike but looked on in disgust as Mouctar Diakhaby scored a 90th minute leveler for the two sides to share the points. In Madrid, Atletico trounced Alaves 3-0 to remain third on the table. Nikola Kalinic, Antoine Griezmann and Rodri Hernandez were all on target in the victory. Elsewhere, Real Betis, Celta Vigo and Real Valladolid were also victorious in their respective fixture last weekend. Betis defeated Vallecano 2-0 in Belaidos, Celta overcame Villareal 3-2 away from home while Valladolid were 2-1 winners away to Real Sociedad.